Out of the 120 players in the 2019 Tribune Chronicle / Mercy Health Fitness Challenge community weight-loss competition to benefit charity, only 15 missed weighing in on Thursday. Four were on the same five-member team. That, despite a high of only 8 degrees and a low that dipped to minus 7 but felt more like minus 25. At least we waited for it warm up a tad. Wednesday’s wind chill dropped all the way to 32 degrees below zero. But the Fitness Challenge gang warmed themselves with exercise and health foods. That’s why, two weeks in, we’re already nearly a half ton lighter — 948.75 pounds, to be exact. Anyone want to buy a bunch of used, supersized belts? The Big Dogs now are the lead dogs in the Go-Getters division this week. The Dogs shook off another 25 pounds to hit 5.5 percent of their starting weight lost. Mission Slimpossible slipped into second place — barely — at 5.4 percent. The next-closest team is the LPJ Lean Machine in third with 3.5 percent of starting weight lost. Just Weight maintained its lead in the Dynamo division, but the gap is narrow. The quintent from Trumbull Family Fitness in Warren have lost 6.5 percent of their starting weight. But Thinning the Herd is stampeding at 6.2 percent, and The Slimsons lived up to their name to be at 6.1 percent of starting weight loss, more than a full percentage point ahead of fourth place Lowery Family Dental (5 percent). “We started out looking like a bunch of Clydesdales,” said Herd captain Jim Parry, “but are going to end up a herd of Shetland ponies. Just Weight captain Jim Miller said it’s no time to panic. “We congratulate all the teams for a great start and anything else that happens is out of our control,” Miller said. “We can only keep working hard and eating right … and see where it takes us. This week, the teams of the week are the Big Dogs for the Go-Getters, with 2.02 percent lost in the past week, and The Slimsons, with a single-week 1.91 percent performance. We often refer to the Fitness Challenge as a lighthearted competition for a serious purpose. We encourage silliness. A playful spirit helps us engaged and helps stave off the tedium and agony that weight loss can become. But we take seriously the service organizations that we help by shedding the excess baggage. And that weight loss addresses very serious personal concerns — our health. February is American Heart Month, and the American Heart Association and the Centers for Disease Control and Prevention remind us that heart disease is the No. 1 killer of Americans and in the world. One out of every four deaths in the U.S. is attributed to heart disease. According Fitness Challenge co-sponsor Mercy Health, these are the major contributing factors to heart disease: high blood pressure, high cholesterol, obesity, smoking, excessive alcohol, diabetes, lack of sound sleep, sedentary lifestyle and unhealthy eating habits. Guess what? The Fitness Challenge addresses every one of those buffet of factors, either directly or as a result of living a healthier lifestyle. Changing unhealthy eating and drinking habits and getting off the couch to move, move, move directly impacts blood pressure, cholesterol, blood sugar and solid sleep. If you really want to kick up the exercise, you’ll find that snuffing out the cigarette will keep you on the track longer. So keep up the fun and games. But celebrate as well the kindness you’re doing to your muscle in your chest that needs to keep beating through this American Heart Month and many more to come. A wide variety of free fitness classes designed to tone, improve flexibility, build strength and improve overall health are available through the Mercy Health Stepping Out program. 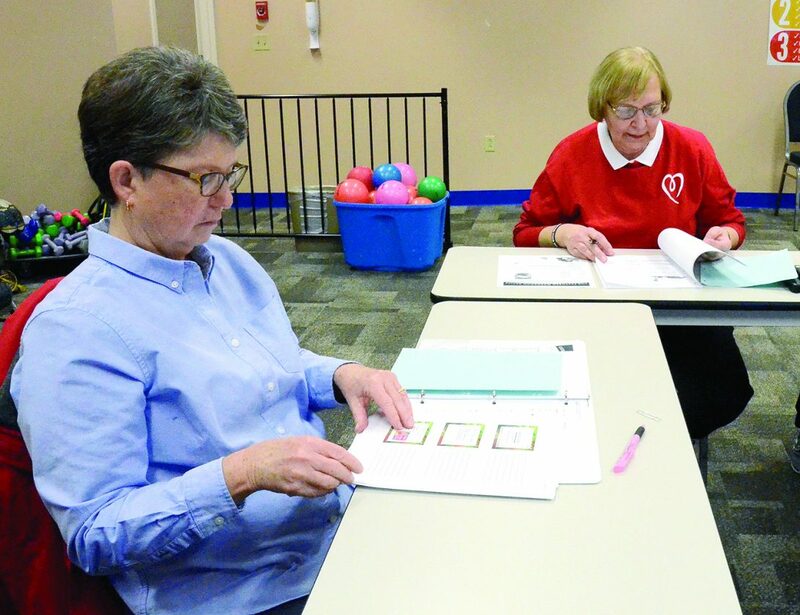 Through grants provided from the Mercy Health Foundation, the weekly classes held Mondays through Saturdays throughout Trumbull and Mahoning counties include line dancing, aerobics, chair aerobics, Zumba, yoga and core strength training, fitness walking and kettle ball, as well as healthy eating programs and demonstrations and health care screenings. Like the Fitness Challenge, the group concept builds in layers of peer support and accountibility to workouts, going beyond just physical needs to social and emotional as well. Classes are open to any Mahoning Valley resident 18 and older. In Trumbull County, classes are held at Grace AME Church, Niles Wellness Center and Trumbull Family Fitness. Call 330-720-3293 for class schedules or to register. See a schedule on page B8. Of course, you can find most of these classes year-round at St. Joe’s at the Mall, our official Fitness Challenge weigh-in site. Call them at 330-652-7542. But they might cost a bit. Each week, we tip our napkins to one of the Fitness Challenge beneficiaries. This week, the spotlight turns onto Someplace Safe, the group designated by God’s Busy Bees. “My ladies’ group from Believers’ Christian Fellowship, God’s Busy Bees, collects supplies for Someplace Safe and does some nice things for the children there,” Bees captain Gayle Wood said. The Someplace Safe domestic violence shelter in Warren for women and their children states that its mission is “to reduce and prevent domestic violence and improve the quality of life for victims of domestic violence in Trumbull county. “We provide emergency temporary shelter for women and children who require immediate safe refuge due to family violence. Survivors receive shelter, food and personal care items. We also provide services to men who are victims of domestic violence, work with other Trumbull County community services and offer program referrals,” the organization states. This week, Rudy Pekarovic explains his team’s name, the Fructose Fighters.